Debbi and I are back from a three-day trip to Las Vegas. This time around we went to meet up with her parents, who are spending the week there. We flew in Sunday and had an evening to ourselves before they arrived, and had our usual dinner at Bally’s Steakhouse, which was delicious as always. The waiters there are also terrific: Low-key yet entertaining. Ours introduced himself and said, “I’m here to bring you whatever you want.” Whatever we wanted was an appetizer of beef short rib ravioli, two steaks, sides of asparagus and onion rings, and a very rich chocolate hazelnut praline dessert. Oh, and two glasses of wine. We rarely indulge in these sorts of restaurants, but we do like this one. Since it was a nickel slot it wasn’t the ginormous win it could have been, but still: It may be years before either of us hits another of those. Deb’s parents, Jerry and Sis, arrived in the early afternoon. They’re not the big walkers that Debbi and I are – we regularly walk all over the Strip and are usually pretty pooped by the end of the day – so we cut back on our perambulations some. We did head up to Treasure Island where we had dinner at Kahunaville, an island-themed restaurant we discovered a few years back. They were a bit short on staff so we had a longer wait than we’d expected, but the food was still good. Jerry got a huge drink in a souvenir glass which we all shared, in addition to our own drinks. Then we went to Harrah’s to see comedian Rita Rudner, who was very funny. I think I’ve seen a little of her in the past, but not a whole lot; her material focuses on gender differences. If you enjoy stand-up comedy, I recommend her. We also went to the Flamingo where we looked in on their reserve of birds and fish, and their elaborate network of pools. Next time we go during warm weather (highs were in the 80s every day we were there) we might stay at the Flamingo and use their pools. On the gambling side of things, Debbi picked up Pai Gow Poker, since she’d been getting frustrated with not winning much at the slots or video poker machines. She thinks she’s found her game now, since she was winning or breaking even almost every time she played. I played too and finished up slightly at the game. We played a couple different (though slight) variants of the game, though they’re all basically the same. At one table a fellow sat down and made a big bet on the bonus circle and was dealt a royal flush, which won him five hundred dollars instantly! Yoiks! For myself, I played regular poker, and had my winningest time ever in Vegas, even factoring in a poor first day there. I mostly crushed the low-limit games, which was satisfying since I ought to be able to crush those games at this point. I also played my first casino session of no-limit poker (at a 1/2 table) and won there, too, mainly on the strength of a 20-minute run of good hands. I saw a few tables where the betting was crazy before the flop, but this table was relatively sane: Some loose calls before the flop, but a fair respect for raises after the flop. I’ve been nervous about playing no-limit in the casino for a while, since I’m sure it can be very different from our fairly disciplined home games that I play in (for much lower stakes – on a really bad night you might lose all of $60, but that’s pretty rare), but this makes me think perhaps I should be playing no limit more often. 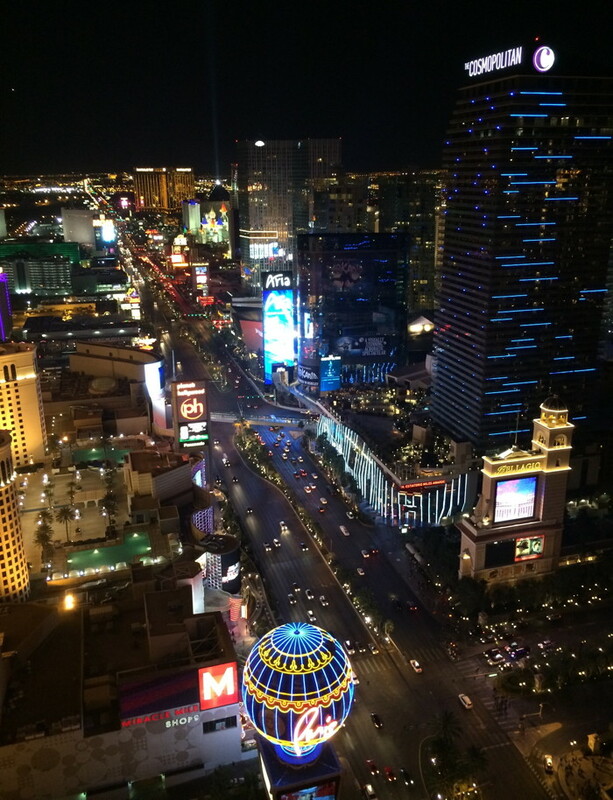 We’re just back from a long weekend in Las Vegas! Last year we went for 4 nights since we went out to see the Hoover Dam, but I think we felt that was a little long, so we cut it back to our usual 3 nights this time around. We’ve been staying at the Excalibur the last few trips, largely because it’s really cheap to stay there, but this time we got a decent deal and stayed at the MGM Grand. Not only is it in the monorail, but it also has Fat Tuesday, the daiquiri place we patronize. We were really impressed! Not only did we actually get a king-sized bed (something the Excalibur always seemed to promise but never delivered) but our room wasn’t down at the end of the hallway. It’s also kind of neat how the hotel’s exterior lights give the room a green glow when you get back at night. Yes, it’s the little things. But fundamentally we were happy with the bed, and the shower, and the location, which is pretty much what you pay for in a hotel. So I’m sure we’ll be going back. We weren’t sure which show to go see this time around, although there are several that interest us. But while I was browsing various hotels’ web sites looking for information about their poker rooms, I came across the winner: We bought a couple of tickets and went Saturday night to see Wayne Brady, whom we’ve enjoyed for years on Whose Line Is It Anyway?, who’s playing at The Venetian. Although Brady was the headliner, he had a partner/foil for his improvisational comedy. The 90-minute show featured a song for an audience member, and the side-splittingly hilarious sketch where Brady and his partner alternated words in a story. This one was so funny I nearly peed myself. Brady is also a talented singer and performed several soul and funk songs with a strong backing band. It was a great show and we might go back next time. I played a lot of poker this weekend. The reason I’d been checking out the casinos’ poker rooms on-line was that I’m interested in playing 7-card stud, but it appears that stud is all but dead on the Strip. The only stud game I actually saw going in the rooms wde went to was at The Mirage, but the 8 people seated all looked to be older, serious players, so I expect it was a very tough game, and I decided to pass on it. I’d also expected to crack no-limit hold ’em in a casino, but I ended up playing a lot of low-limit hold ’em and was having pretty consistent success at it, so I figured I’d stick with what was working. The Venetian: I played in the 4/8 game here, which was lively and felt tough, although I only played for an hour before Wayne Brady’s show. I didn’t get a strong feel for the room, but it felt classy. Planet Hollywood: Formerly the Aladdin, PH has substantially renovated this hotel. Unfortunately I had a bad experience playing 2/4 in their brand-new poker room, in that the table had a couple of ill-tempered players at it which gave the whole thing a bad vibe. I left soon after I got there. They also don’t have a computerized waiting list. Disappointing. Bally’s: Despite having stayed there once and gambled there many times before, I’d never played poker there. The poker room is small and in the middle of the casino floor, which means it’s not as isolated from the ambient smoke as other rooms. That said, I had a terrific time here playing 3/6: The dealers were friendly, funny, and professional. The chips are stylish. The other players were friendly, too. Everyone seemed to be having a good time. I’d definitely play here again. Mandalay Bay: This is why I only played at the MGM once: Mandalay Bay has a terrific poker room, with excellent dealers, high-quality tables and chips, and fantastic table service. Also, the 2/4 game has only a single $2 blind, eliminating the $1 small blind, and no requirement to post to come in. The players were a mix of younger and older players, but the older players mixed in well with a younger crowd. I recommend this one. Rivering quad Jacks and getting paid off by someone who made a full house. Flopping top pair (a pair of 8s!) and getting bet down to the river by an opponent. An Ace hit on the river, he bet, I thought for a short while, and finally called. “Nice call,” he said, turning over King-high. Somehow I just couldn’t buy that he had me beat. More importantly, I figured I had the best hand at least half the time, so the pot odds made it worth the call. This sort of thinking is what I’m most pleased with in my development. Playing K-J on a K-Q-x flop, betting and getting called by two players. The turn is a J, giving me two pair, and the river is a Q which also completes a diamond flush. One player bets, another one raises, and I just see too many ways I can lose, so I fold. Naturally I folded the best hand, which was a bummer since that was my biggest losing session of the weekend. Here’s the big one: One guy is playing almost every hand and raising preflop every time as well. Preflop he goes all-in for $5, and every player at the table calls him – a 9-way pot. I call with A-To. Flop is T-8-3 with two hearts. I’m first to act (I was the small blind) and I bet with top-pair-top-kicker. Everyone calls. The turn is an 8, and I bet. Only one player folds. At this point the dealer remarks on what a big pot this is. The river is a 7, so someone could have hit a straight, but the flush didn’t come in. I bet, and only 2 players call. I show my tens-and-eights with top kicker, and one other player shows tens-and-eights with a King. The other two fold, and I win. Wow. There’s still plenty of room for improvement, of course, and I haven’t even cracked no-limit other than against my friends, but still, I had fun and I feel like I’m getting better. Can’t beat that. Monday night we rode The Deuce bus (so called because it costs $2 each way to ride) downtown to the Fremont Street Experience, which is basically “old school” Las Vegas. It’s where the World Series of Poker began, at Binion’s Horseshoe. Fremont Street has been turned into a partially-covered pedestrian mall with an hourly show projected on the roof in the evening. It was worth a visit, but I wasn’t especially impressed (the show was an impressive display of technology used for very frivolous ends). Binion’s is surely nothing like it was back in the day, but it does have a large poker room and a number of displays related to poker history. Worth a look. It was interesting to me that some of the old Las Vegas kitsch is still there (like the cowboy above the Pioneer casino), but the insides of the old casinos feel very classy, with wood paneling and stylish decor. Contrast to the “new Vegas kitsch”, like the Luxor‘s elaborate Egyptian themes, or even the swank Italiana of the Venetian. The newer Vegas seems more self-conscious, whereas the old Vegas seems to scream, “It may be goofy, but we guarantee you’ll have fun!” If a 50-foot-tall neon cowboy can seem more authentic than a giant glass pyramid, then that’s what Fremont Street has going for it. And of course we played some slot machines and video poker. And didn’t win at either, although Debbi seemed to do better at them when I wasn’t around. Plus we got to brave some rain both on Fremont Street and while wandering around on Monday. But nothing like what the Bay Area’s gotten, I understand. The weekend went by way too quickly, and I definitely don’t feel like going into work tomorrow. But, all good things etc. As always, it was a fun trip and we’ll go back if not this year then next winter. Maybe by then I’ll be ready to play some no-limit hold ’em in a casino. 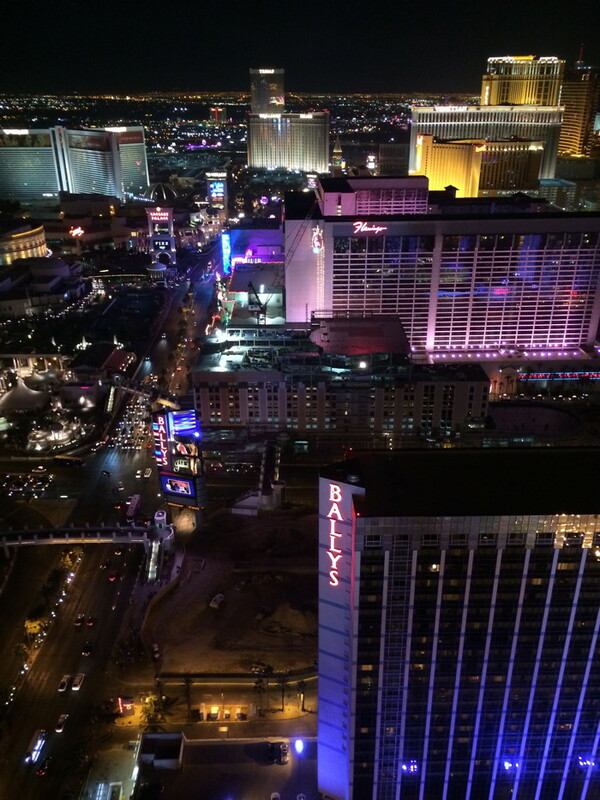 A roundup of my poker exploits on our recent trip to Las Vegas. 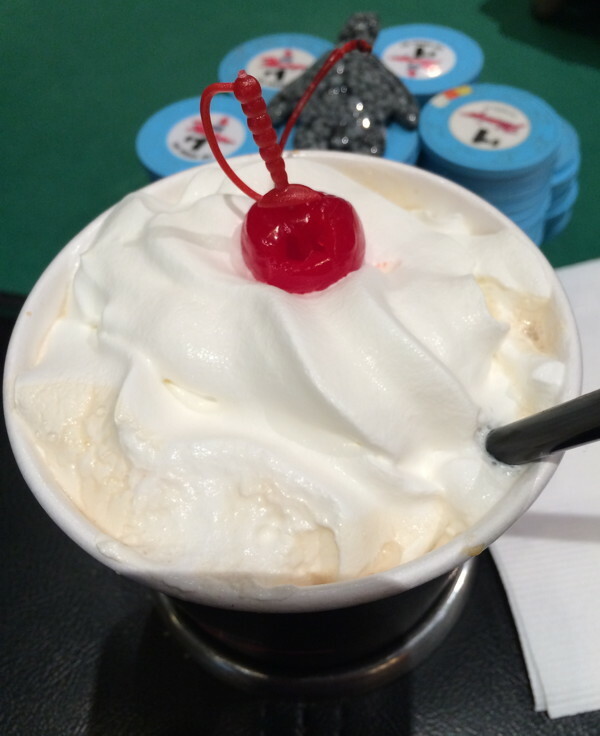 Okay, a roundup of my poker exploits on our recent trip to Las Vegas. After a fashion, the highlight of poker on the trip was playing playing the 11 am $65 no-limit hold ’em tournament at the MGM Grand. This was actually my first experience playing no-limit hold ’em; all of the cash games I play are low limit, which means the amount you can bet in each round is strictly structured. In no-limit, of course, you can bet any amount at any time up to your total chip stack. This tournament provides everyone with $2000 in chips for their buy-in. Blinds start at $25/$50, and go up every 20 minutes. This is a very fast tournament; by the fifth level, someone was going all-in on every hand because of the escalating blinds and antes. Moreover, only about 10 hands (i.e., one full orbit around the table) were played per level, so everyone would post only one set of blinds before they went up. The tournament started with 6 tables of 10 players each, and an alternates list who would sit when someone got knocked out. I was alternate #2, and was seated about halfway through the first round. Ultimately there were about 95 buy-ins, including people who got knocked out and rebought as an alternate. One guy next to be rebought twice. The top 8 finishers won money. I sat down and my very first hand I was dealt a pair of 7s. So I raised to $300, everyone folded to the big blind, and the big blind went all-in. He had about $900 left, so I could either surrender my $300 raise, or potentially lose half my stack. I dithered for a moment, and decided to fold. Over the next 40 minutes my stack steadily dwindled, as I never managed to hit anything on the flop. Finally I got down to about $1100, with blinds of $100/$200, and played J-To. I flopped two pair and pushed all-in, getting two callers. One guy made a straight on the turn, but then another ten came on the river giving me the winning full house. I had tripled up and was still in it! I went all-in again not longer after that with A-K, and everyone folded so I won the blinds and antes. I managed to win a couple more pots, and when the first break came after the fourth round I had about $5500, which I judged to be above-average. Shortly after the break I went all-in against a short stack, and a larger stack went all-in as well, forcing me to go all-in, along with a fourth player. The short stack won the hand, but I came in second, and since I had him covered I picked up the rest of the chips, and came out slightly ahead. Overall I was very happy with my play, finishing 24th out of 95. I had some luck, but I think I played fairly well, too. This tournament is so fast-paced that luck probably oughtweighed skill overall. (Games that emphasize skill tend to have higher buy-ins, $150 or more.) But I think I got a feel for how the game is played, and I had fun. And that’s what counts. I played about 9 hours of cash games, almost all of them at $2/4 limits, and one at $3/6 limits. The ritzy poker rooms tend to start at $4/8, and I don’t think I’m quite good enough to go to those limits. I’m still not a winning player, after all. By contrast, the Excalibur‘s poker room is right in the middle of one of the main access ways. Even though all poker rooms prohibit smoking, the Excalibur’s therefore gets a lot of ambient smoke, which is not so great. Bally’s is similar. The Luxor and Flamingo put their rooms in corners at the edge of the casino, which is sort of a compromise. Mandalay Bay and the Rio put them in separate rooms which are open on one or two sides; the Bellagio and Venetian do something similar, but dress up the room to make it stand out more. And Caesar’s Palace and Harrah’s have completely separate rooms for poker. Some poker rooms have snazzy video waiting lists, which makes it very easy to figure out what games are going on and whether there’s any wait. I was more willing to try new rooms when they had these screens; some rooms don’t have visible waiting lists, which deterred me somewhat from trying them. Overall, I think Excalibur and Luxor have the easiest tables to play at of those I’ve tried, while Caesar’s is the toughest. The MGM is somewhere in the middle. Of course, I probably don’t have a large enough sample to draw any firm conclusions. My worst round was at the $3/6 game at Caesar’s. I didn’t play real well, didn’t have a lot of luck either, and lost $73 in an hour. Ouch. I had a session at the Excalibur that was about half as bad, but in that case I just never got any cards. On the other hand, I had another session at the Excalibur which cancelled out the bad one. And I was up-and-down at the MGM, and had a bit of bad luck at the end of a session at the Flamingo which left me down a little after being up a bunch. Bummer. The more I played, the more I had to think about: I realized why some people say that slowplaying two pair is a bad idea, since it’s much easier for someone to beat you. Two pair is a good hand, but you do want to knock out people on draws. I need to be more careful playing two overcards to the flop, as I think I’m too quick to call bets in that situation, or bet out myself. Finally, I need to pay better attention to the odds, as I think I fold in some situations where I could continue. The one hand I keep coming back to is this: In one session I kept being dealt Ace-rag. It was a loose and very passive game, so I started playing some of these hands. One hand I had A-7 offsuit. The slop was Q-8-2 with two clubs, and I had the Ace of clubs. One player bet, and I thought for a moment and folded. But in retrospect I think I should have continued. The reason is that any bettor probably had either top pair or a flush draw. If I hit an Ace, then I will have a better top pair, and since I have the Ace of clubs, anyone on a flush draw would not be helped in that case. However, if a club hits, someone on a flush draw would make it, but I’d have a redraw to the nut flush, if a fourth club came. With 7 bets already in the pot, I think I had the odds to call, and it was likely that there would be enough callers that I could continue to the river, as well. So I should have called. And indeed, the next two cards were clubs, and the winner had a flush that I would have beaten had I stayed in. Ironically, the very next hand I had A-6 offsuit, the flop was like A-K-3 with the K-3 being of my Ace’s suit. This time I did go to the river, and my top pair beat my opponent’s pair of Kings.